DealChicken Travel | Great Deals on Travel Sent Right to your Inbox! 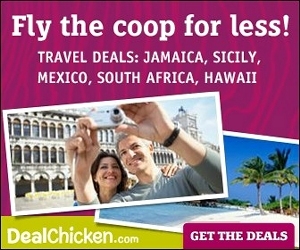 Home / Deals / Online Deals / Daily Deals / DealChicken Travel | Great Deals on Travel Sent Right to your Inbox! If you love to travel, or want to do more of it, be sure to sign up for DealChicken Travel. Join their email list an get deep discounts on travel, from quaint bed & breakfasts to tropical escapes delivered right to your inbox. Get great deals like those listed above and tons more! Wherever you are dreaming of heading to next! For all of my tips on saving money, shopping with coupons, and more, check out out my Saving Money Page! Photo Poster for just $1 + Shipping! Great Father’s Day Gift!